A statuesque blonde draped in bias-cut, ivory silk charmeuse is a classic image of glamour. She drinks champagne, has breakfast in bed on a tray, takes bubble baths, and breaks hearts. A puff of maribou trims the toe of each of her slippers. Now that this image is firmly in mind, let's tweak it. Give our blonde a few years in a Swiss finishing school, a lusty appetite for lobster at midnight, and a laugh a little too loud for her patrician mother, and you have Guerlain Vega. Substitute wine coolers for the champagne, a facility for Pig Latin rather than French, and an addiction to patent leather heels from Payless, and you have Etat Libre d'Orange Vraie Blonde. They're sisters from opposite sides of the tracks. 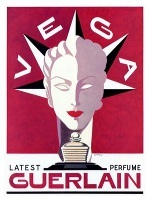 Jacques Guerlain created Vega, a blowsy floral aldehyde, in 1936. Guerlain re-released it in 2005 as part of its "Il Etait Une Fois" series. The Guerlain website lists its notes as aldehydes, cassia tree, bergamot, jasmine, ylang ylang, sandalwood, iris, amber, and vanilla. I also smell lavender and a pinch of coriander. Vega is what I imagine Marilyn Monroe sleeping in rather than Chanel No. 5. Although they're from the same genre of perfume, I find Vega more exuberant and emotional than No. 5. Vega Eau de Toilette balances elegant, nose-tingling airiness with the weight of spice, creamy flowers, and sweet wood. After the first sneezy breath, the slightly sour herbal hit from tarragon, lavender, and coriander surprises me with its reminder of a masculine fougère. But the lush load of flowers, heavy on the ylang ylang, signals Vega is all woman. The ylang ylang persists into its sweet, woody dry down when Vega's spiciness has faded almost away. Vega is distinctive without being demanding. Although Vega may not play by the rules of many aldehydic florals, she will still make it into the country club. Seventy years after Vega's launch, Antoine Maisondieu created Vraie Blonde Eau de Parfum for Etat Libre d'Orange. Its notes are aldehydes, champagne, rose, peach, white pepper, myrrh, patchouli, and suede. Here, too, I smell coriander, jasmine, and ylang ylang. In Vraie Blonde we get a traditional aldehydic floral's perfume-y opening, but mixed with unexpected fruit, herbal notes, and pepper, rounded out with smooth flowers. Like Vega, it applies airiness to a creamy floral body tinged with an intriguing hint of tangy-sour. But Vraie Blonde opens sweeter and fruitier than Vega and sits more heavily on the skin. Instead of Vega's champagne, I get cocoa-tinged ginger ale. Its dusting of pepper also sets it apart from Vega, making it feel more modern. An hour after applying it, Vraie Blonde's fruitiness is gone, and what's left is a warm, peppery wood with a little of the tang lingering. Vega may be a surprising composition, but Vraie Blonde is almost baffling. Somehow it all works, and while I wouldn't go so far as to call it elegant, it's as glamorous as all get out. Both Vega and Vraie Blonde have moderate sillage and last five or six hours on my skin. I adore Vega, and if $300 ever fell into my lap, I'd buy a bottle in a second. In the meantime, I'll settle for the more reasonably priced Vraie Blonde. It just might suit me better anyway. Guerlain Vega is $305 for 125 ml Eau de Toilette; for buying information, see the listing for Guerlain under Perfume Houses. Etat Libre d'Orange Vraie Blonde is $80 for 50 ml Eau de Parfum; for buying information see the listing for Etat Libre d'Orange under Perfume Houses. Great comparison and descriptions! 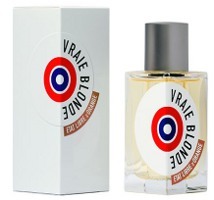 Why is it that all reviews of Vraie Blonde make me like the scent so much better than actually smelling it? I find it overly creamy and fruitier and tangier as time goes on, but perhaps that is the effect of having smelled it on paper more than on skin. The Etats are particularly deceiving on paper, I think – perhaps because they go in so many directions at once, so getting mostly topnote is not going to give you a good idea of how a given one is going to progress and bloom on you. Anyway, I find I like the concept of VB, but my fave ELdO in practice is Encens et Bubblegum. Vraie Blonde is an odd one in a way Vega isn’t. With Vraie Blonde, I almost feel like I’m standing in the middle of a house where all the rooms go together, but they’re all distinctly different. You know, here’s the tangy kitchen, here’s the fruity hall, here’s the aldehydic-gingerale living room. That makes it fun to wear, and interesting, if not super easy. I do love Like This, though, and Jasmin et Cigarette and Encens et Bubblegum are great, too. I can’t believe I consider myself a “Guerlie Girl” and I have never smelled Vega! Must. Correct. Immediately. Although I’m afraid that I’ll end up wanting a bottle as I do love all things Guerlain. Interesting comparison to Vraie Blonde too. I’m wearing SSS’s gorgeous aldehyde – Champagne de Bois – today.Love those fizzy aldehydes! Vega is fabulous. I really do love it and cherish my decant, but it’s so expensive! I almost had a bottle once. I bought it in New York and had them ship it to me, then discovered it cost $50 more than the SA had told me! He had charged my cc without even letting me know it had “unexpectedly gone up”. I sent it back. Someday I’ll have a bottle, though. Hmm….. someday maybe we need to do a split. You know, I think I need one of those terrific 5ml bottles of CdB. My sample’s gone. I’ve become addicted to CdB this summer, Mals. By next spring I’m going to need another ounce in one of her gorgeous new bottles. Vega is so gorgeous! I have a small 5ml decant that I cherish. Oddly, you know (or maybe not), I found it perfectly at home at casual events like baseball games, as well as at church. Wish I could afford a bottle – I’d wear the heck out of it. Sigh. I still haven’t tried VB, due to my violent “Oh, they think they’re so kewl!” overreaction to ELd’O’s advertising. But having liked Putain de Palaces recently (thanks, Joe), I think I must find a sample of it. I admit I get a little irritated at L’Etat’s marketing, too, sometimes. It can feel condescending sometimes (I’m looking at you, Fat Electrician). But the perfumes are really interesting! I seem to remember having been put off trying VB by the P:TG review referring to “strange, milky, bruised-fruit” effects and to a likeness to Yvresse (which was utter disaster for me). Are you getting anything of the sort? I was a little disappointed with the staying power of Vega – I can’t do the spray-until-wet thing because it gives me aldehyde headaches, so it just disappears fairly quickly. What’s your experience with it, Angela? I didn’t find Vraie Blonde much like Yvresse, although it’s true they both have a little peachy-nectariney hint. Vega lasts reasonably well on me, I’d say. I can spray it on in the morning, get medium sillage for a few hours and a nice, quiet glow until mid-afternoon. So it’s me, then. I’m getting 3-4 hours max out of Vega. Sigh. I don’t mind peach if it’s tangy, but the lactonic stuff just killlllls me. The creaminess is definitely there in Vraie Blonde. Still, it’s always kind of nice not to long after something! I too am put off by the ELDO uber-cool style. Also, I get wearily accustomed to companies based in Europe or North America who not only don’t ship their stuff to Australia, or NZ, or anywhere too far south of the equator, but don’t seem to care. Those that do ship and do care, especially the niche companies like Sonoma Scent Studio, get hugs from me. I know there are issues with international shipping, but some companies’ websites make shipping info so hard to find, you’d think the rest of the world does not exist for them. Oh well – there are still lots of great scents that I can try! That must be frustrating! I feel like I have enough trouble trying things, especially niche lines, since I don’t live in New York or near Nieman Marcus. I’m glad, at least, there are companies that do make it easier to ship to you. Does Australia have an equivalent to Luckyscent? You’re asking the wrong person if all that’s enough…. Maybe you should open a niche perfume shop! It sounds like the market down there could sorely use one. Great reviews, my sister to No 5, floral aldehyde of choice is Amouage Dia but I’d love to try these too. I love the Vega bottle! A department store in my area stopped stocking ELDO just as I was ready to start exploring the line but I recently noticed that ELDO sell a sampler set of all their fragrances (including Like This) on their website so I might just spring for one of those. I’ve had a heck of a time sampling L’Etat’s fragrances and have relied on the odd sample that has accidentally fallen into my path (thank you for the sample of Vraie Blonde, you know who you are!) to smell them, so I know how you feel. Do try Vega if you get the chance! I really like it. Just been looking at that ELDO sample set for a few days now – as Abyss says it includes Like This…20 1.5 ml samples for 49 euros delivered…sounds very reasonable, wish more would do it. 20 fragrances! I guess I didn’t realize how many of them there were! No kidding! I thought there were ten at the most! I need to do more research I guess. Loved the concept of Vraie Blonde, didn’t like the actual smell Now I’m dying to give Vega a try! If you do try Vega, I’d love to know what you think of it. Both sound interesting in their own right, but ouch on Vega’s price. While I’m with you and Mals on the snooty advertising, Vraie Blonde may be worth a look since I also want to try Like This. Going back 2 weeks or so….you mentioned Songes works in the heat. I finally faced my fear (it really was fear) and wore it on a scorcher of a day. It was wonderful–can’t believe I’ve let so many hot days go by without wearing it! Blossomed quite nicely and never became overpowering. So glad you (and Denyse) mentioned it. I’m glad you tried Songes in the heat! It definitely is a big one, but especially on warm nights it’s so nice. I’m loving Songes in the summer, too. I didn’t know if it would be too much since I went the EdP route, but it is beautiful, especially in the evenings as it just has this dream-like quality about it. I got a decant of Vraie Blonde in a swap and just adore it. It’s so bright, cheerful and fun and definitely holds down that corner in my perfume collection. So much so that I’ve been considering a full bottle. For $80, especially for a niche house, it’s a great price. I haven’t tried any other frags in the line, but do love VB’s joyful swings from fruity to floral to a soft leather, and the fizzy opening is an instant mood lifter. I’m afraid to try Vega as there are already too many pricy Guerlains I want and am having to budget far into the future to obtain, so perhaps I will just imagine what it smells like and try to be content with my guess. Oh, and I didn’t really find much in common with Vraie Blonde and Yvresse save for their aldehydes. Yvresse, to me, smells more grown up and classy where as VB is just fun and pleasant if not quite as refined and dignified. But that’s okay since I’m not always in the mood to pull off Yvresse anyway. “Fun” is a great description of Vraie Blonde. I completely understand your desire to forget about Vega until the lottery comes through! Great review Angela, as usual. They both sound fabulous and I have smelled neither (I’m always trying to avoid Guerlain urges! ), but now I think I’ll have to try and test them both. Knowing about good fragrance smell-a-likes is useful, especially when one fragrance is discontinued, super $$$, hard to find, etc, and the other is not. It’s hard to say Vraie Blonde is a substitute for Vega, because it’s really not, but they have some of the same spirit, at least I think so. Vega is much more refined, though. But they’re fun to smell side by side! Hi Angela: I have a small decant of Vega, but I think it’s very not me. I may swap it away at some point, but it’s nice to have for reference. I do have a sample of Vraie Blonde that I need to revisit — that one seemed much more wearable and smooth to me somehow, though still a bit feminine/fizzy/aldehydic for me. In a different vein, have you tried ELdO’s animalic floriental, Putain des Palaces? It’s quite interesting. I’ve learned to really enjoy so many ELdO creations; I think they do some great work. Coincidentally, today I’m wearing Eloge du Traitre. Hey, I’ll email you later – wore PdP last week and liked it. It reminded me of Citizen Queen, except rather LESS, um, naughty. Surprised me. I noted your comment above after I posed mine; I’m glad you liked it. Who knew that a Putain would smell LESS naughty than a Queen? Joe, it’s shameful how few of the L’Etats I’ve tried, and I haven’t tried Putain des Palais (at least that I remember.) I’ll definitely keep my eyes open for it, though. If you decide to swap away the Vega, let me know. Maybe we can arrange something. As much of a Guerlain ‘ho (and aldehyde lover) as I am, I can’t believe that I haven’t tried Vega either. It’s probably the fear of loving it beyond all reason and having to plunk down the $300. I’ll have to give the ELDO a try – even though my experience with them has been a mixed bag. I love Like This and have a healthy decant, but Jasmine et Cigarette was a disaster on me. Vega is kind of hard to track down, like Sous le Vent. If it weren’t for a really generous friend, I may not have even smelled it. I really like it, though! It smells so pre-war, post No. 5 to me: ladylike and aldehydic, but still passionate and a tad off-kilter. Ooh… Sous le Vent is another one that I can’t decide if I “need” to have it or not. I love the opening and like the rest of it – the far drydown is yummy, too – I just don’t know if it’s worth that much more than the other stuff that I already have. I feel exactly the same way. I really like it, BUT…I like Vega better, though. If you’re not wild about it, it’s probably not worth dropping all that cash for. You could get a big bottle of Amouage for that kind of dough. The NM in the Houston Galleria has both Vega and Sous le Vent at the Guerlain counter, and I sniffed both of them a couple of months ago. I liked them both, but I can’t really say whether I liked either of them enough to buy a FB, as I tested a lot of things that day, so it all got a little muddled after a while. I did think that Vega was a very nice floral aldehyde, and I really love the bottle. I might buy a decant, but I probably would not go for a split unless I was to be the one splitting, because I would definitely want to have the bottle. The bottle truly is beautiful, and I can imagine wanting it for that! Vega is one of those scents that I don’t think of as a showstopper, but rather as a beautiful daily scent, you know what I mean? I can imagine if I were smelling lots of things, I might overlook it. I have been very deficient this summer – last year I made it down to the Galleria several times. This year, I haven’t made it once – and I’m back to school next week. That still leaves a couple of days, right? I’m so jealous! Someday I’ll have a bottle, I will. You’re right, it’s a big bottle for the money. I agree. I’d love to see it in a 50 ml bottle, and I’d buy one for sure! Really great reviews Angela! When I sampled the Vraie Blonde, there was *something* about it that reminded me of Lovely. I know – weird, right? But that’s what I kept getting a whiff of and I don’t know what that’s all about. I really must wear it again and see if I get that similarity next time too. Now you’ve done it – you’ve unleashed a lemming for Vega again and I had almost forgotten about it, gosh darn it. HA One of these days, I must get my hands on some. I forgot to say. That Vega bottle! Awesomeness. The bottle is truly magnificent. It would deserve its own special niche in the perfume cabinet! I’ll have to try it next to Lovely. It’s weird how perfumes can bring out things in other perfumes. heavy sigh…..you would think I would LOVE Vega, I love Chanel no5, Divine L’Ame Soeur, Dia….I’m one of those rare creatures who LIKES… aldehydes for goodness sake….but Vega did absolutely nothing for me….my skin tends to pick a note and run with it….out of Vega my skin latched onto the aldehydic note and then picked up a sort of milky peach….but mostly a 500lb aldehyde molecule that was very nearly overwhelming….my split went to a better home, and it’s happy now. You’re not alone in liking aldehydes. My first perfume loves were Chanel no. 5 and Arpege, which were on my mother’s dressing table. I don’t know how unusual it is for a 4 or 5-year-old to like aldehydes, but I did, and still do. Lavender can smell really fougere-ish sometimes, and if that’s not what you’re aiming for, I can see where it could wreck a scent for you. Weird that you would say that, Daisy, because I’m wearing L’Ame Soeur today and was thinking it reminded me a lot of Vega. Strange timing. Funny how different of an experience each of us can have with the same thing. God, I love perfume. Hmmm.. maybe I wouldn’t like it then. L’Ame Souer was a SCRUBBER on me… and I am the aldehyde queen. I can’t remember what it was that was so horrible – because the notes sounded wonderful and then it turned on me. I hate it when that happens! It’s a money saver, though. L’Ame Soeur kind of reminds me of No. 22. LOL –I love L’Ame Soeur…..don’t like Chanel 22 either…..another perfume/nose fluke. Actually Chanel no22 and Vega are very very similar to my nose. Interesting! I don’t think of them as smelling a lot alike at all, but it’s been a while since I’ve smelled No. 22. Maybe I need to do an aldehydic showdown. Angela– would that be an aldehydic showdown or a (wait for it ) SMACKdown? I love no 22 myself, but after stocking up heavily on *bay (including lotions and bath powder) have to admit that I can’t wear it everyday as a signature fragrance, as I might have done in the old days. Sometimes one needs a more subdued or even moody scent. Would I like Vega?– I’m afraid to try. Not another expensive, hard-to-find love, please! I get a lot of pinky sweet fruit out of L’Ame Soeur. Which makes it a terrific summer scent, iffen ya ask me. I like it, I don’t love it… I do love Vega. No. 22 is allll sugarbowl on me. I can practically feel the grains of sugar crunching between my teeth. Yerk. GG, it just might be a smackdown! Maybe it’s an experiment best done when I know I have a few hours alone. Mals, No. 22 is so flowery, but sweet? I can tell it’s been too long since I’ve worn it! Must remedy. Hi Angela! I read this with interest, though I haven’t tried Vega or Vraie Blonde. I haven’t yet learned to appreciate the traditional aldehydic floral style, and perhaps I never will. However, I recently fell hard for CdG Stephen Jones, the prettiest violet I ever smelled. It definitely has aldehydes, but they work for me in that one! Stephen Jones is great, and I love the bottle. There are so many different kinds of aldehydes, and they feel cool, clean, and metallic to me in CdG Stephen Jones–so refreshing. Yes, it worked great for me on a recent hot day. Something certainly adds an appealing metallic edge that doesn’t give me a headache like some high-aldehyde fragrances! Oh, and the bottle and the box… sorry so off track here. Gosh, you’re making me crave some! So glad you enjoyed Vraie Blonde. It’s one of those that I like so much that I could never imagine anyone not liking it. I’m a VB proselytizer– I keep forcing it on everyone in hopes that someone will see it the way I do. If I were Empress of the Earth, I would enact a law that the phrase “old lady” could never again be used in connection with perfume. Or if someone does say “old lady”, they must smile and bow and be clear it is a total compliment! Yeah, I think of it as a compliment. My idea of classic or sophisticated might be someone else’s idea of “old ladyish.” Truth be told, I got a lot of my taste in perfume from some of the old ladies who were in my life when I was a kid. What they were wearing was in fashion at the time, so maybe most people now think anything other than a fruity floral smells old ladyish. Another good example of why we wear perfume for ourselves, and not to please anyone else. I think you’re right about people who haven’t smelled much perfume with care calling most non-fruity florals “old lady”. “Powdery” is popular, too. It’s kind of like someone who looks at a Jackson Pollack and says “my 6-year old could do that”. They just don’t get it. Well, that person doesn’t deserve you, does she?! She missed out on some good perfume! Good on YOU. Some ‘friends’ are best left behind. It took me years to realise this. I really don’t see her much anymore–we don’t have much in common, really. There are only so many hours in a day, and we may as well spend them with people who make them worthwhile. Ha! I got your package today (thank you! I’ll email you about it) and had to recheck it to see if Vraie Blonde was in there – yep. I’ll check it out tomorrow and let you know what I think. Glad everything made it there! Let us all know what you think of Vraie Blonde! I hated it in the vial, hated it when I first applied, now it is kind of growing on me, but it is pretty weird. ……. Had to wash it off – I have a little headache and it was not helping. I’ll try it again, though. Vega – the name, the bottle and ads are AMAZING. It’s so perfectly Art Deco I don’t even care about the juice, if I can ever get my hands on the bottle (empty or otherwise) I’ll be thrilled!